A recent study, affiliated with South Korea's Ulsan National Institute of Science and Technology (UNIST) has introduced a novel targeted drug delivery system in the fight against cancer. A team of researchers, affiliated with UNIST has recently introduced a novel targeted drug delivery system that can improve the pharmacological and therapeutic properties of conventional cancer treatments. 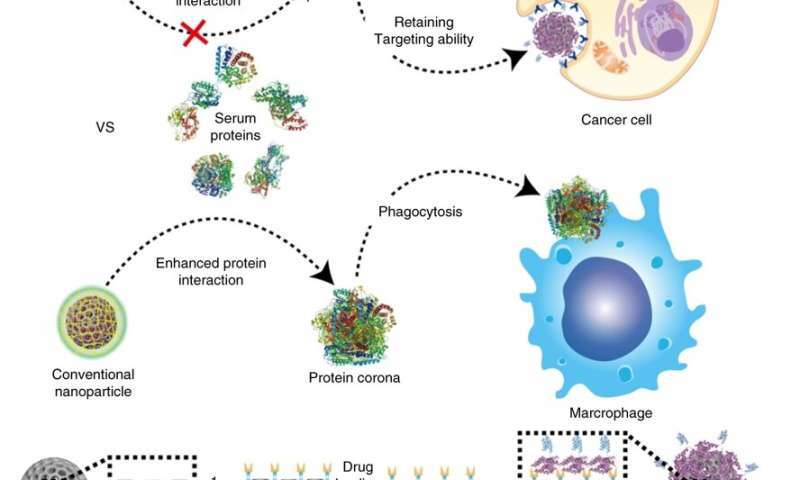 The new technology has dramatically enhanced safety and efficiency through the use of the supramolecularly built protein corona shield as a targeting agent through regulating the interfaces between nanoparticles and biological systems. This breakthrough has been jointly led by Professor Ja-Hyoung Ryu, Professor Sebyung Kang, and Professor Chaekyu Kim in the School of Life Sciences at UNIST. Their findings have been published online in Nature Communications (IF: 12.353) on October 31, 2018. "It was reported that it is possible to alleviate the impact of protein corona on target drug delivery through the formation of protective shield, made up of well-structured special proteins that are highly stable and do not interact with each other," says Professor Ryu. "The new technology is much like the strategy where you take control of your enemies, using enemies." In this work, the research team introduced the protein corona shield (PCS) concept for an efficient target drug delivery system. Using recombinant DNA technology, the research team has created recombinant fusion proteins with the enhanced physical stability and cancer-selective targeting ability. This fusion protein, then, was used as a shield to encapsulate the surface of nanoparticle drug carriers, thus constructing PCS nanoparticles (PCSNs). showed about 10 times greater therapeutic efficacy in preventing the invasion of unwanted external proteins. "Aside from treating cancer, our findings can also be applied to a variety of fields, such as the diagnosis and treatment of various diseases, as well as the heat-optical therapy," says Professor Ryu. "We plan to introduce a platform that will perform various roles while differently designing recombinant proteins in the future."